Comfort House Eagle Address Plaque - - personalized eagle shape address number sign complete with eagle feather accents. Approximately 5.5"W x 12"H. Made in the USA. 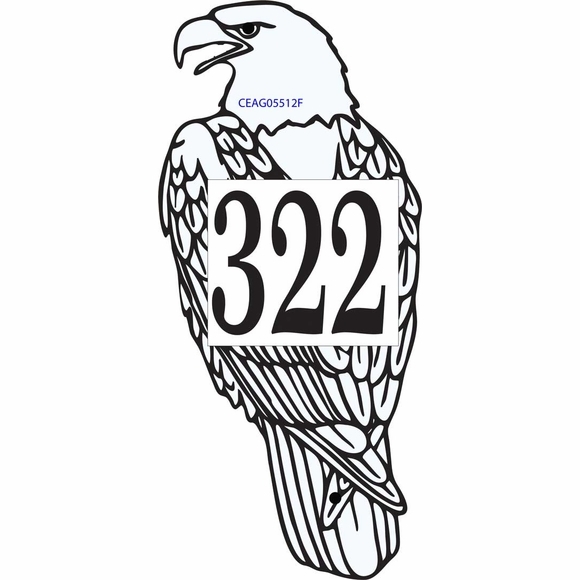 Eagle silhouette wall sign is custom made with the house number your supply. Holds address number with up to three (3) 3" characters. Note: style number visible in the sample (CEAG05512F) is not printed on your eagle. Two color combinations: white with black characters & feather accents or black with white characters & feather accents. Dimensions: 5.5"W x 12"H x 1/8". More eagle silhouette sizes available: can scale smaller or larger up to 36" tall. Please contact us with your requirements. Personalized eagle shape house number sign made in the USA.